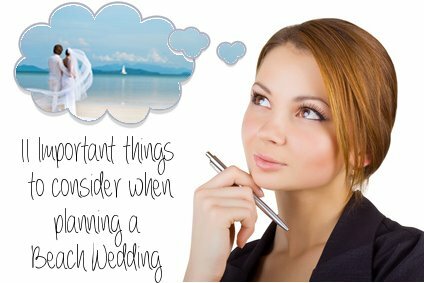 Beach wedding planning is much like planning any other wedding. You can find a helpful wedding planning spreadsheet on many websites or in bridal magazines. In your planning you must factor in the typical weather at the time of the wedding. Is it early spring with hot days and cooler nights? Is it midsummer and sweltering hot both day and night? Is it during the rain season? From which direction is the prevailing wind? You might also think about a Wedding Tent of some sort or a few umbrellas for shade if it will still be very sunny at the time of the ceremony. Or how about some cute Paper Parasols in your white or in your wedding colors. For an early spring or autumn beach wedding, planning for colder weather might be useful. Have small inexpensive lap blankets made in your wedding colours or in plain white and leave them on every second seat for the ladies. A couple of portable heaters might also work, or if it is allowed, a fire or two. 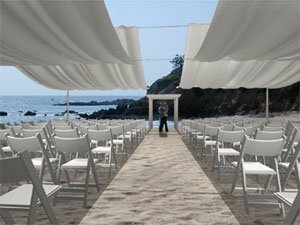 In you beach wedding planning, try and arrange your seating so that your guests do not have to stare into the sun while trying to concentrate on your wedding vows. Remember sunscreen. Try and order a few small sample bottles from a sunscreen company and have them handy with the programs and/or confetti for the guests who forgot to put some on before the ceremony. Or give away some Individually Wrapped Sunscreen Towelettes to each of your guests. If your beach wedding will continue into the evening make sure there is enough light in the area that can safely lead your guests to the toilet facilities and back to their cars. Whatever time of day or season you decide on, always remember that a well-informed guest is a happy guest. Make sure you state clearly that some part or all of the wedding will take place on a beach so your guests can take the neccesary precautions themselves and can dress appropriately. You envision perfect weather, a glorious sunset, a gentle breeze, your love by your side and smiling guests. However, Mother Nature often has her own agenda! Good beach wedding planning must always include a backup in case of inclement weather. If you are having an indoor reception, consider having your ceremony in the same venue as a backup. Alternatively book a tent for the ceremony. This is always helpful if you can drop the sides to shelter from prevailing wind, shelter guests from the sweltering sun and provide cover for intermittent showers. If your entire wedding will be under open skies, think about booking a tent anyway and then deciding a few days in advance (when you can have a look at the weather predictions) if you think you will need it. Just remember that most companies will still charge you for a portion if not the full rental for the tent whether or not you decide to use it. But it definitely is a small price to pay for peace of mind! Keep in mind that the seaside is synonymous with wind. You can at least expect a fresh breeze. Inform your hairstylist that you will marry on a beach so they can suggest a few styles that will work well for your hair. Again, make sure you have a backup in case of Gale force winds. 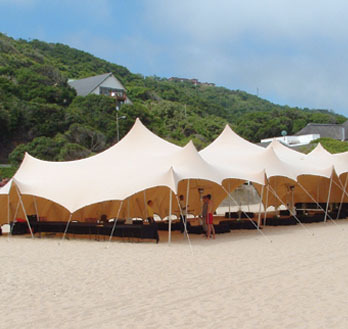 You may also consider some windbreaks in your beach wedding planning that can easily be put in place the morning of the wedding by a few strong men. Will everybody be able to hear? The beach can be an awfully noisy place with crashing waves and rushing winds. If you are expecting more than 20 people then consider renting a PA system. If it will only be your ceremony on the beach, a small portable PA system (works off a car battery) should do the trick if there are no power points close by. A generator might also be an option, but make sure you have a very long extension cord as generators create a lot of noise themselves and will have to be placed a distance away. Your DJ, band or a local Audio Visual rental company will be able to advise you. 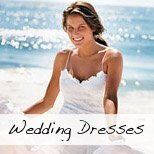 Follow this link for help in choosing your Beach Wedding Music. Acquire a tide table from a local fishing tackle shop. Make sure you visit the beach during high tide. This is all to make sure that you can have your wedding in the desired spot and not be caught unexpectedly by the high tide! All service providers that will contribute to the wedding must be aware of the exact location of the ceremony and/or reception on the beach. Have a site meeting a day or two in advance (preferably at the same time as you are planning the wedding) to make sure everyone is sure where to set up.Service providers will often have to do some beach wedding planning of their own in order to make your dreams a reality. Caterers will have to consider food that will keep well under hot and windy conditions, DJ's and bands will have to make sure their equipment is kept as sand free as possible. Rental companies will have to plan for the time involved in carrying chairs, tables and decorations onto the beach. A tent (if you are using one) will have to be set up, which could take twice as long on a beach as on a normal grassy area. Seagulls are notorious beggars and thieves. Make sure you cover all food well. In doing your beach wedding planning, don't forget to contact your local parks department, municipality or other local government to acquire a permit to have your wedding on your chosen beach. Be sure to find out about any laws or rules regarding the rigging of structures such as tents and bridal gazebos, trash removal, glass and alcohol on the beaches and the use of fires or torches. If restrooms are not available or the available restrooms are not up to standard, then consider it in your beach wedding planning to hire in some portable toilets. Some of these can be very classy with running water; hand soap, towels and self sustained lighting. Curious onlookers and uninvited guests are also considerations in your beach wedding planning. A private beach may be the answer. If you are using a public beach, find out if you can designate a part of the beach especially for your wedding, or try and find a cove or a spot secluded slightly by dunes. Is there an electrical point nearby to run lights, sound and catering equipment? Is there running water? If there are no electrical points then you will have to bring in a large enough generator. Try to find a semi-silent generator or have sufficient extension cords to allow the generator to be placed a distance away. Also ensure you have a backup generator and extra fuel. If no running water is available you will have to remove all dishes from the premises to be washed elsewhere. Your caterer and bar staff will have to be made aware of this so they can make provision for extra cutlery, crockery and glassware. Ensure you have some large containers of fresh water for making coffee and for bar purposes. Your hire company will also have to be notified that some items may be returned dirty. They will most probably charge you a small fee for cleaning. Ensure that you have enough garbage bins and bags available and please make sure you leave the beach in a cleaner condition than you found it in. Remember that beaches are not only for human recreation, but is home to many creatures. 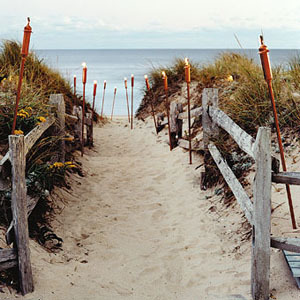 Follow this link to help you with your Beach Wedding Planning for Ceremonies. Find out how you can save money on your ceremony, bridal gown, reception, and more.